The pharynx is a five-inch long tube that starts near our nose and ends at our windpipe. The pharynx is generally considered a part of the throat in both vertebrate and invertebrate animals. In humans, it is a hollow structure (or muscular cavity) lined with moist tissue. This is typical of all structures within our alimentary and digestive tracts. Having a moist lining with a mucus rich barrier allows us both to breathe and for our food to travel safely through our canal without damaging our sensitive tissues. The muscular pharynx effectively forms the entry for the esophagus, or our “food canal,” and the trachea, also known as our “windpipe.” For this reason, the pharynx is considered a part of both our respiratory and digestive systems. The image above illustrates the human pharynx and its surrounding structures. As we will discuss in more detail below, the pharynx is comprised of three sections. 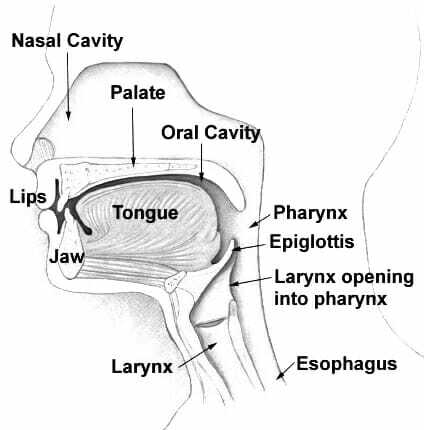 The pharynx’s location can be said to start in the space immediately behind our nasal cavity, and ends just above our esophagus and larynx – which are the two main passageways that follow entry at the mouth for food and air, respectively. The pharynx measures about thirteen centimeters long and is made up of several sections. The uppermost portion of the pharynx is called the “nasopharynx,” which makes sense given its proximity to our nasal cavity. As such, it is the space where air is able to move its way through the nose and eventually into our respiratory linings, again demonstrating the pharynx’s role in our respiration. This area is called the conduction zone as it filters, warms, and injects the inhaled air with moisture so that it is able to pass into our lungs successfully. 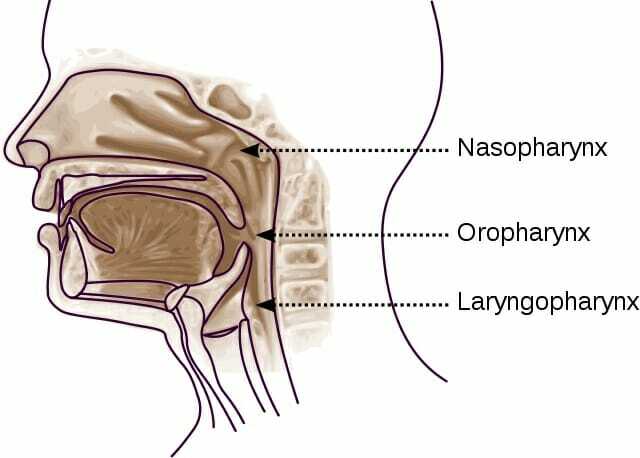 If we were to visualize the nasopharynx physically, its uppermost portion lies between the base of our skull to our soft palate and ends near our tonsils. In the same vein, the “oropharynx” is the “oral” section of the pharynx. It is thus found in the region near our mouth, staring at our soft palate and ending at the epiglottis – which is the high-rising “flap-like” tissue found posterior to our tongue. Finally, we have our laryngopharynx. This section lies between our epiglottis and ends at our esophagus. Our esophagus, of course, is a continuation of the passageway that moves food to our gut through peristalsis, or muscular pulsing. The diagram above illustrates these three areas or sections of the pharynx. With respect to the muscles that make up the pharynx on a microscopic level, there are two muscular structures. The outermost layer is comprised of circular muscles that function as constrictors. Circular muscles essentially tighten, or constrict, our “tubing,” which in this case is our pharynx. Each of the pharynx’s sections has pharyngeal constrictor muscles on their outermost layer that are each innervated by our vagus nerve (a massively important parasympathetic nerve with ties to the workings of the heart, lungs, and intestinal tract). The muscles that lie underneath this outer layer are our inner longitudinal muscles. These are comprised of three muscle bands that stretch some distance and notably look different than the circular outer muscles. For instance, the Palatopharyngeus layer extends from the hard palette to the pharynx. However, quite similar to the outermost layer is the fact that two of the three inner muscle layers are also innervated by the vagus nerve. The blood that supplies the pharynx’s muscles comes from the external carotid arteries, which branch into several arteries that each will feed a different muscle area in the pharynx. This blood will ultimately exit into a network of tiny veins known as the pharyngeal plexus that will drain into the internal jugular veins (IJV) that run along our neck. As mentioned before, the pharynx has roles in both the respiratory and digestive systems, and can be thought of as the point where these systems diverge. While food and liquids will follow the alimentary canal through the esophagus, the air we breathe in through that common entry point will enter the trachea and follow into the respiratory system. The pharynx’s respiratory role is mainly to allow inhaled air entering the nasal cavity to make its way to the respiratory tract – which includes the larynx, the trachea or “windpipe” and finally the lungs’ bronchioles and alveoli where respiration takes place. This is made possible by the “isthmus” or structural common-space that connects the oral and nasal pharyngeal areas so that we are able to breathe through our mouths and noses. The pharynx has an equally big digestive role thanks to its muscles. The constrictive circular muscles of the pharynx’s outer layer play a big role in peristalsis. A series of contractions will help propel ingested food and drink down the intestinal tract safely. The inner layer’s longitudinal muscles, on the other hand, will widen the pharynx laterally and lift it upward, thus allowing the swallowing of ingested food and drink. An interesting role the pharynx also plays is in projecting speech. Sound is made possible by the passage of vibrations through air. The pharynx provides a nice enclosed space that will allow speech muscles to initiate sound and resonate it so that it projects even better. 1. Why is the pharynx considered to be both a part of the digestive system and respiratory system? B. The pharynx is located proximate to the entry of the trachea and the esophagus. B is correct. The pharynx is the section of our oral and nasal cavity that immediately precedes entry to our airway via the trachea, and intestinal tract via the esophagus. 2. What is a main difference in the types of muscles that lie in the outermost pharyngeal muscle layer versus the inner muscle layer? B is correct. The outermost muscular layer of the pharynx is comprised of circular muscles that act as constrictors, compared to the longitudinal muscles of the inner layer. The vagus nerve (a parasympathetic nerve) innervates both structures types. 3. Which artery feeds the pharynx? C is correct. The external carotid artery branches into several smaller arteries that feed different areas of the pharynx. The pharyngeal plexus, on the other hand, is the venous drainage that drains from the pharynx into the IJV, eliminating those answer choices.